Instant downloads of all 942 LitChart PDFs (including The Cop and the Anthem). 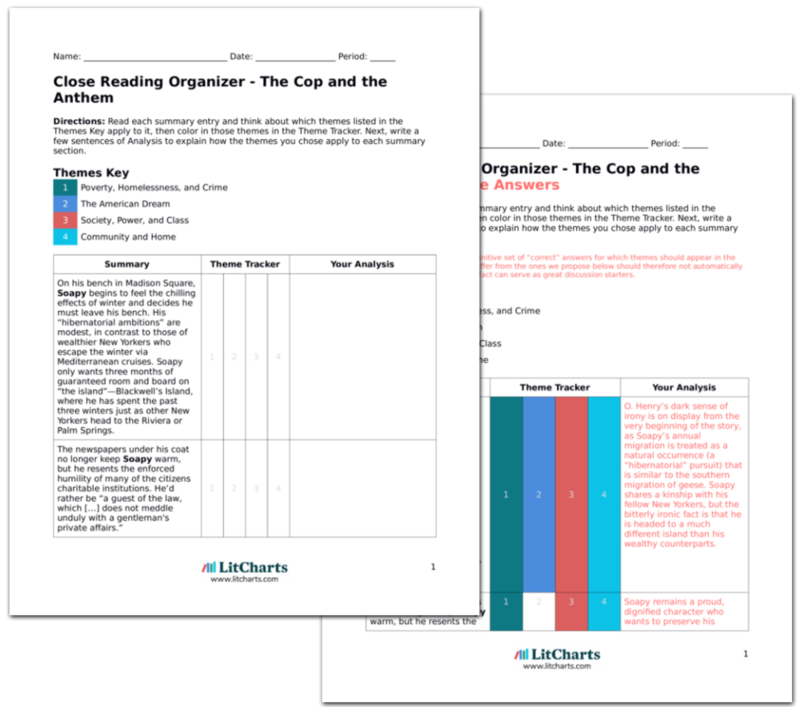 Welcome to the LitCharts study guide on O. Henry's The Cop and the Anthem. Created by the original team behind SparkNotes, LitCharts are the world's best literature guides. A concise biography of O. Henry plus historical and literary context for The Cop and the Anthem. A quick-reference summary: The Cop and the Anthem on a single page. In-depth summary and analysis of every of The Cop and the Anthem. Visual theme-tracking, too. Explanations, analysis, and visualizations of The Cop and the Anthem's themes. 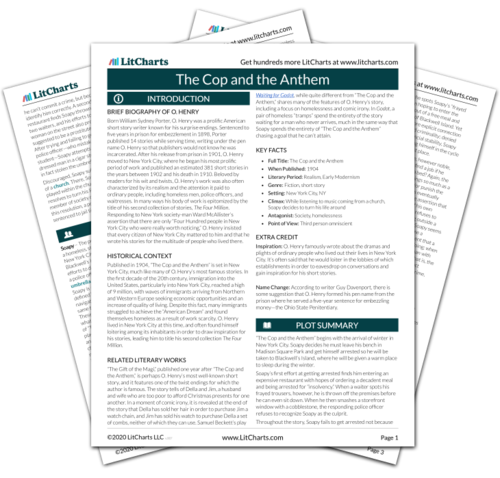 The Cop and the Anthem's important quotes, sortable by theme, character, or . Description, analysis, and timelines for The Cop and the Anthem's characters. Explanations of The Cop and the Anthem's symbols, and tracking of where they appear. An interactive data visualization of The Cop and the Anthem's plot and themes. Born William Sydney Porter, O. Henry was a prolific American short story writer known for his surprise endings. Sentenced to five years in prison for embezzlement in 1898, Porter published 14 stories while serving time, writing under the pen name O. Henry so that publishers would not know he was incarcerated. After his release from prison in 1901, O. Henry moved to New York City, where he began his most prolific period of work and published an estimated 381 short stories in the years between 1902 and his death in 1910. Beloved by readers for his wit and twists, O. Henry’s work was also often characterized by its realism and the attention it paid to ordinary people, including homeless men, police officers, and waitresses. In many ways his body of work is epitomized by the title of his second collection of stories, The Four Million. Responding to New York society-man Ward McAllister’s assertion that there are only “Four Hundred people in New York City who were really worth noticing,” O. Henry insisted that every citizen of New York City mattered to him and that he wrote his stories for the multitude of people who lived there. 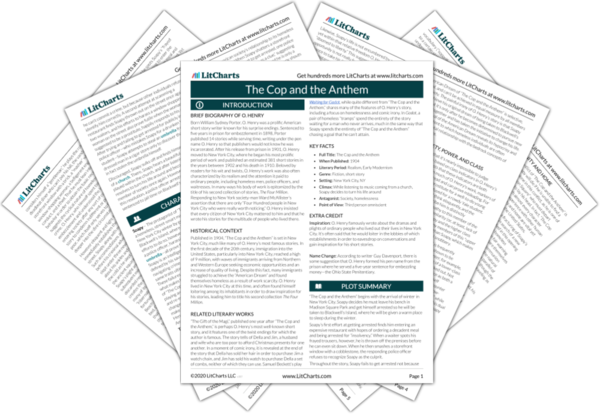 Get the entire The Cop and the Anthem LitChart as a printable PDF. Published in 1904, “The Cop and the Anthem” is set in New York City, much like many of O. Henry’s most famous stories. In the first decade of the 20th century, immigration into the United States, particularly into New York City, reached a high of 9 million, with waves of immigrants arriving from Northern and Western Europe seeking economic opportunities and an increase of quality of living. Despite this fact, many immigrants struggled to achieve the “American Dream” and found themselves homeless as a result of work scarcity. O. Henry lived in New York City at this time, and often found himself loitering among its inhabitants in order to draw inspiration for his stories, leading him to title his second collection The Four Million. “The Gift of the Magi,” published one year after “The Cop and the Anthem,” is perhaps O. Henry’s most well-known short story, and it features one of the twist endings for which the author is famous. The story tells of Della and Jim, a husband and wife who are too poor to afford Christmas presents for one another. In a moment of comic irony, it is revealed at the end of the story that Della has sold her hair in order to purchase Jim a watch chain, and Jim has sold his watch to purchase Della a set of combs, neither of which they can use. Samuel Beckett’s play Waiting for Godot, while quite different from “The Cop and the Anthem,” shares many of the features of O. Henry’s story, including a focus on homelessness and comic irony. In Godot, a pair of homeless “tramps” spend the entirety of the story waiting for a man who never arrives, much in the same way that Soapy spends the entirety of “The Cop and the Anthem” chasing a goal that he can’t attain. Inspiration: O. Henry famously wrote about the dramas and plights of ordinary people who lived out their lives in New York City. It’s often said that he would loiter in the lobbies of which establishments in order to eavesdrop on conversations and gain inspiration for his short stories. Name Change: According to writer Guy Davenport, there is some suggestion that O. Henry formed his pen name from the prison where he served a five-year sentence for embezzling money—the Ohio State Penitentiary. Schoonebeek, Danniel. "The Cop and the Anthem." LitCharts. LitCharts LLC, 7 Feb 2019. Web. 21 Apr 2019. Schoonebeek, Danniel. "The Cop and the Anthem." LitCharts LLC, February 7, 2019. Retrieved April 21, 2019. https://www.litcharts.com/lit/the-cop-and-the-anthem.